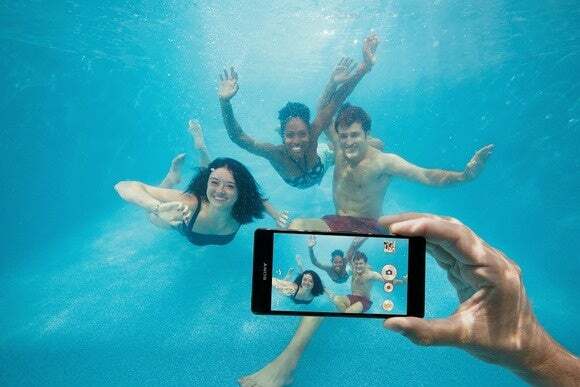 Sony Mobile is warning against immersing its waterproof phones in water. Sony Mobile is changing its stance over its waterproof phones. Apparently, when the company says Xperia phones are waterproof, it just means that if you try to use them underwater you’ll end up with proof that H2O can destroy your phone. Well, not quite—but Sony’s got a lot of explaining to do. The company was not available for comment at this writing. We’ll update this article should the company respond. The waterproof explanation page for Sony Mobile Xperia phones now includes the following disclaimer, “Remember not to use the device underwater,” as first noted by Xperia Blog. That’s a surprising turnaround considering the company has advertised Xperia waterproof phones with images of people using their phones underwater. Xperia waterproof phones typically have an IP65/68 rating, which means they are completely resistant to dust, can resist low-pressure water jet spray for at least 3 minutes, and can remain functional after immersion below a minimum 1 meter (3.28 feet) depth. In practical terms this means Xperia waterproof phones can stand up to a heavy rainstorm, a non-water immersing web browsing session in the bath, or a run under the bathroom faucet. But all those shots of fun loving people taking videos in lakes and chlorine-laden swimming pools? That's pushing it. So can I take it underwater or not, Sony? At least according to some pages. As Xperia Blog points out, other parts of Sony Mobile’s site still encourage you to dive underwater with your device. The impact on you at home: If you have an Xperia waterproof phone you should heed Sony’s warning even if you’ve taken underwater shots with your phone in the past. Should it get damaged during such an excursion, Sony could refuse to help and point to its support materials that warn against taking them into the water. Sure, it has tons of marketing materials encouraging the opposite, but those images aren’t to be taken literally, it seems. This story, "Don't use waterproof Xperia phones underwater, Sony says" was originally published by Greenbot.